Peanut butter and jelly. What in the world other than a sandwich am I supposed to make with that? That was my first thought after reading the Improv Challenge ingredients for April. Usually I’m all for thinking outside of the box and trying to create something that no one else will have thought of. But then I found these cookies. They were just so cute that I decided to hell with the creative recipes, I want to make these! So that’s just what I did. Let’s back up a second. If you’re a new follower/reader you may not know what the Improv Challenge is. The short and sweet of it is that Kristen, over at Frugal Antics of a Harried Homemaker, created this little challenge where each month there are two ingredients and you can make whatever you want as long as they are included. Obvious, unusual, savory, sweet, strange…whatever you desire. Then, on the third Thursday of each month, we all post and share our creations. Sound interesting? If you want to join, just click HERE for more information. 1. In the bowl of your stand mixer with the beater attachment, cream together the butter with both sugars. 2. In a bowl, combine the flour, baking powder and salt. 3. Add the peanut butter and egg to the butter/sugar mixture and mix until combined. Slowly add in the flour until fully combined. 4. Refrigerate the dough for 10-20 minutes or until its easy to handle. 6. Scoop about two tablespoons of the dough and roll into a ball. Flatten slightly into the palms of your hands and place on the baking sheet. Repeat with remaining dough, placing about 2 inches apart. 7. Use your fingertips to press a heart shape into each piece. Refrigerate for 20 minutes. 8. Preheat the oven to 350. In a small bowl, stir the jam/jelly/preserves of your choice to loosen it. 9. 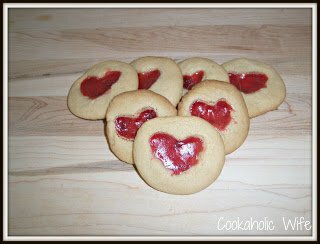 Spoon the jam/jelly/preserves into the heart shape of each cookie. Bake for 16-18 minutes, checking on the cookies around 12 minutes to ensure they don’t burn. 10. Let cool to room temperature on a wire rack then place in a container and refrigerate until ready to eat. The original recipe calls for baking the cookies for 12 minutes then adding the jam/jelly/preserves and baking for an additional 5-6 minutes. I did this on my first batch and my hearts puffed up kinda funny after the first 12 minutes of baking. After adding the jam/jelly/preserves, they didn’t look so pretty. I had intended to just keep going that way and hope I got some cookies pretty enough to photograph out of the deal, but it was late, I was tired and I accidentally added the jam to a batch before cooking them. They turned out much prettier than the other batch so I did that for the remaining dozen of cookies.